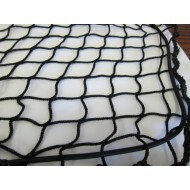 The nets are made from high tenacity polypropylene and are very durable cargo nets. Roll Cage nets can also be made from elasticated netting. The nets can be stretched to surround the opening of the roll cage and easily secured around the sides with plastic or metal clips or hooks, making them easy to put in place and remove when in use. Roll Cage nets provide a barrier around the opening of the cage and prevent items from falling out during transport around a warehouse or in a vehicle. These nets are very high quality and are durable and long lasting. Roll cage nets can be custom made, with or without fittings, to suit your requirements. Roll Cage nets are an effective solution to provide covers for roll cages, roll containers and troll..